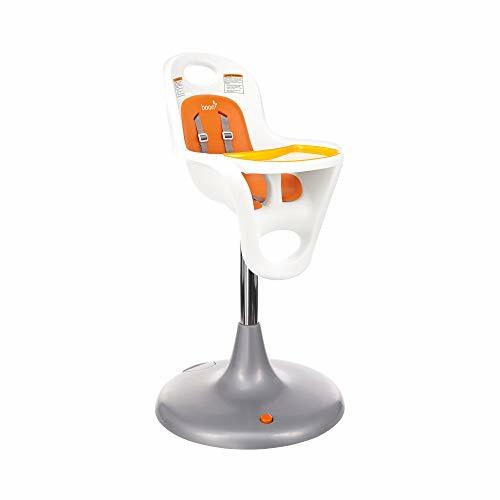 This sleek-looking highchair has three recline options and seven different height positions. It grows with your little one, and it’s easy to clean and store. The premium fabric seat pad may be soft and comfortable, but you can just wipe it if there’s any mess or food remnants stuck on it – you don’t need to scrub it. A wet towel or cleaning with a mild detergent and water can do the trick – but only if you do it ASAP and not leave it to dry for days. It has an extra large tray which you can secure by snapping on from the top down. 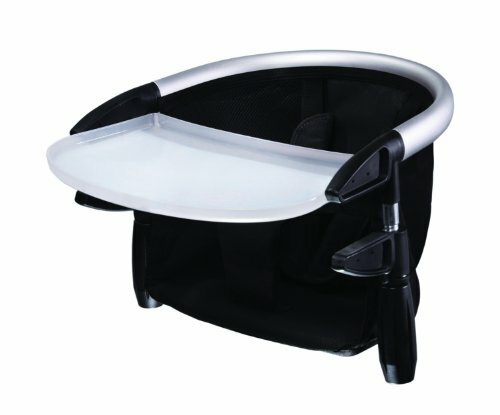 It features a height adjustable footrest which makes it more comfortable for the baby to eat even as they start to grow. Also, you wouldn’t need to buy a new one when they get taller. It has a five-point safety harness which secures the child in place and ensures you they won’t stand or climb out. It’s quick to assemble, and it wouldn’t even take you more than 10 minutes. It doesn’t stand when folded. You will need some support or have something for it to lean on. But you can always just insert it in between cabinets. While the fabric is easy to clean, there are some cracks on it where the food can get in. This one is sophisticated and looks very elegant and stylish. 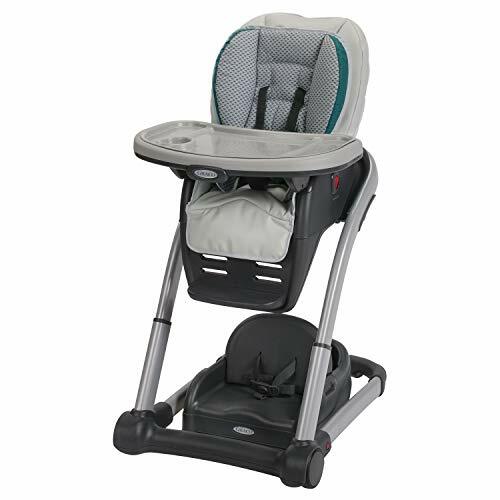 It features six height positions and three recline levels and is convertible to accommodate the needs of your growing child. It has front wheels and locking rear wheel casters so moving it is a breeze. It’s an innovative design and can even seat two children at the same time because it has a toddler booster seat. It ensures a perfect fit because you can adjust it and therefore keep the baby comfortable while eating. It’s convertible so it can accommodate your little one as he or she grows from infancy to toddlerhood or through three years old just as long as they are within the recommended weight. The seat pad is machine washable. If it gets soiled or dirty, just use a gentle detergent on it and air dry. It has luxurious leatherette and will keep the child comfortable and happy during meal times. You can operate the removable tray one-handed. It’s sturdy and durable – you can use it for years. There are no available replacement covers if ever it’s damaged or torn. You always have to make sure the wheels are locked when in use. It looks like something straight out of a futuristic movie. It’s an innovative and efficient design and doesn’t have the common problems and issues you usually encounter with the more traditional-looking highchairs. It features a five-point safety harness and a safety point to keep the baby secured in the chair. There are no cracks and crevices so food won’t get stuck and it won’t be difficult to clean. The tray is dishwasher safe and cleaning it is a breeze. It glides smoothly on the floor and moving it from one place to another is relatively easy. 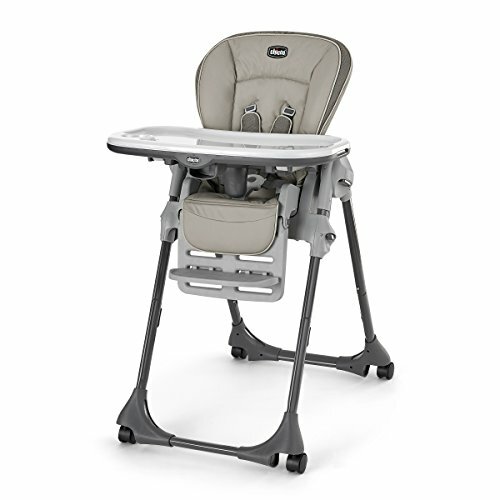 It has a foot-activated lift to make adjusting the height of the highchair hands-free. It easily fits under most tables. It’s sturdy and stable with a base so broad that there’s no chance it can tip over. It has six urethane casters that help to protect your floors. Manoeuvring around the house is easy. The tray is notably smaller than the other products in this list. The pneumatic lift can be difficult to operate at times. It’s way more expensive that other highchairs. Because it’s small, your child might push the food or drink over the edge since there’s not a lot of space on the tray. 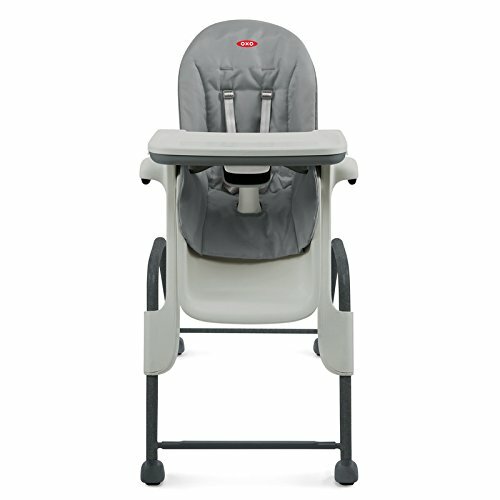 This highchair has three levels of adjustment (three reclining positions and five height settings) which allows you to accommodate a growing child and keep them comfortable and happy while eating. It has an adjustable, contoured seat and a removable tray which are both easy to clean. The cushion is stain-resistant, and you can just wipe it or throw it into a washing machine for regular cleaning. It’s sleek, stylish and the colours aren’t too bright or overwhelming. It’s easy to put together and to adjust it won’t require tools. It’s pretty much foolproof. You can place or remove the tray using only one hand. You can lock the wheels to ensure the additional safety of the child. Storage is easy; you can even put the tray on the back of the highchair’s legs. The tray lays flat, so there’s little to no chance of any spillage or tipping the cup and bowl over the edge. It’s sturdy, stable and keeps the little one secured. You don’t have to struggle with the harnesses because the straps come off easy. The infant has to be at least four months to fit into the highchair. It takes up a lot of space. Thus, it might not be ideal for those with limited floor area. It looks stylish and elegant. Because it’s not like the traditional, bulky high chairs, it’s ideal for those who want something they can bring outdoors because let’s face it, BLW continues wherever you go – even restaurants and diners! Also, it’s light and compact so packing it during travels is convenient and hassle-free. It only weighs four pounds so you can bring it anywhere. It secures the child while keeping them comfortable with a padded back support and harness system. It includes a travel bag so you can easily insert in your diaper bag or purses. It has ‘lobster claws’ which secures the chair to the table and keeps it that way even when the baby wriggles. It uses a clamp mechanism with the help of rubber grips to make sure it won’t detach or get removed by accident. You can clip it to any table or bench top. And storing it is relatively easy. It keeps the little one comfortable and also makes it quick to clean. It cannot and should never be used on glass or any unstable tables as it can compromise the safety of the child. It may not be suitable for parents who prefer something with a robust and stable base. The tray doesn’t stay in place, and the baby can remove it. 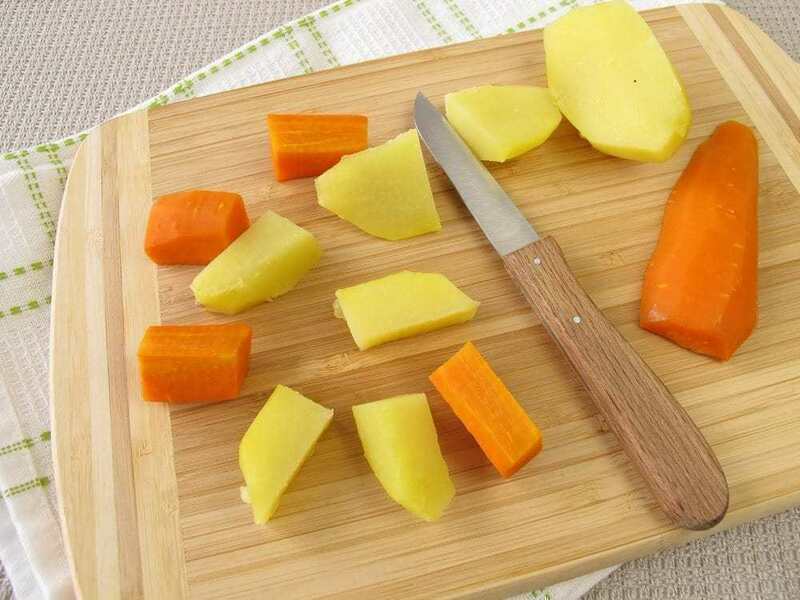 In a nutshell, you skip all the utensils, and instead of offering pureed options, you give them soft-cooked foods (diced or sliced into smaller portions). Remember, however, that everything you feed them should be age-appropriate and nutritious. You give them the food, and they’ll be the ones to put in inside their mouth. Some people might ask: what’s the point in all of this? And whatever you serve them, probably only half of the amount is what they will eat. So, why bother? Well apparently, there are numerous benefits in your child’s development. Because you give them the freedom to try various tastes and textures, there’s less likelihood of being picky eaters in the future. They will most probably eat anything and everything. They can go from nuts to apples and carrots – they will enjoy the whole process of discovering something new and different. When I made purees before, it took me more than 30 minutes to get the texture just right – soft and easy to swallow. And I had to use a magic bullet or blender for baby food to mix all the ingredients into a single-serve puree. With BLW, you just clean, slice and serve. When we used puree, my son needed something to make it more fun for him (otherwise, he’d refuse the food or throw it on my face and shirt). Sometimes, I’d let him draw or h﻿﻿﻿﻿ave a small toy so that he will continue eating. However, when we give him finger foods like sliced apple or oranges, he’d eat away and enjoy every bite. When I said it was going to be messy, I wasn’t exaggerating. Besides, your baby is still developing his or her coordinating skills. 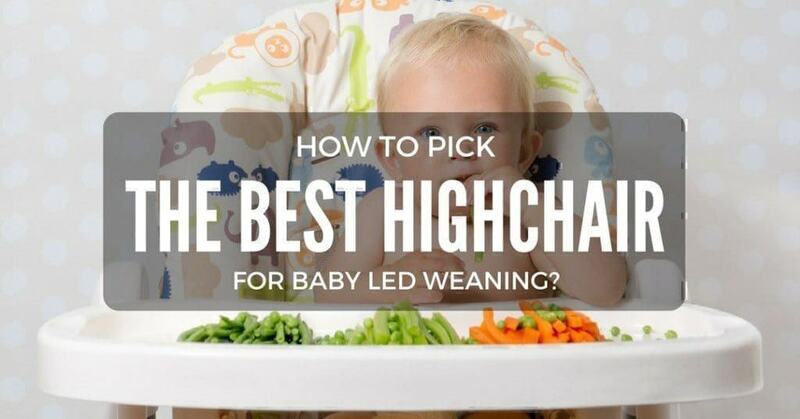 Right now, you should visit this article to know about when can baby sit in a high chair. This is pretty much obvious because mums never buy anything that their babies find uncomfortable – it just doesn’t make any sense. Also, one of our goals is to make mealtime an enjoyable and fun experience for them, and you wouldn’t want them to feel trapped in their chair. They should be able to move around and reach out for the foods. The rationale here is simple – you don’t want food to fall on the floor. Because let’s face it, they’re going to do everything with what you give them – poke, smash, throw or push over. Don’t leave the child unattended. Just because they can eat for themselves doesn’t necessarily mean you can do something else while they’re eating. In fact, in BLW, they should eat with the whole family. Also, make sure the foods are manageable and wouldn’t cause choking. Case in point: slice a single serving of grape, so they won’t swallow it whole. L﻿﻿ock the highcha﻿﻿ir and double check that it won’t easily tip over. 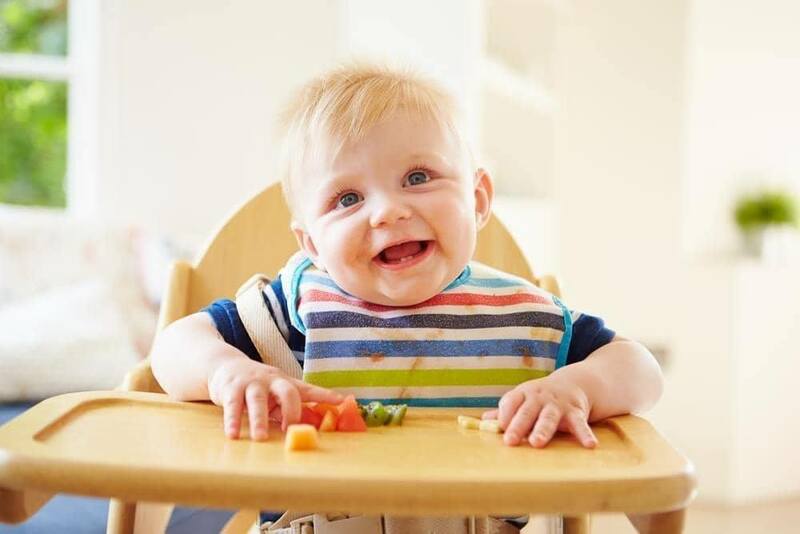 The babies will reach out for the foods on the edge of the chair or explore with whatever is on the tray, so you have to ensure that the high chair is stable. It also helps if the base is wide to keep it sturdy. Use the harnesses or straps. They’re there for a reason, and it’s for the safety of your baby. Especially if they can already stand, strap them in to avoid climbing out and worse, tipping it over by standing. Keep all the hot and dangerous items out of reach. 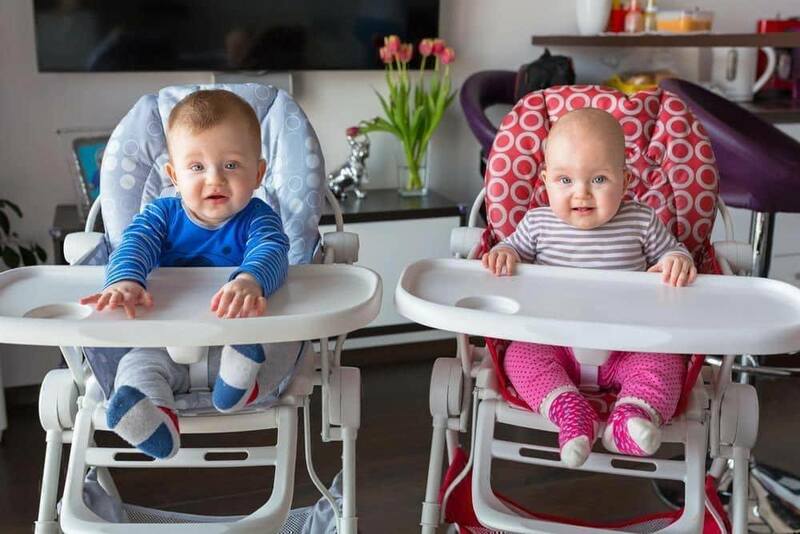 Whether it’s a steaming cup of coffee or fork, it should be nowhere near the high chair or baby because they can reach out for it and well, you know what could happen next. The clear winner for me here is the Graco Blossom 4 in 1 Convertible Highchair Seating System, for the most part, because it has everything you’re looking for in a chair when using the Baby Led Weaning method for feeding. Besides, the downsides to the product aren’t exactly deal-breakers. First, as long as you take good care of it, you wouldn’t need replacement covers. Second, locking the wheels is given because safety is always a top priority whether it’s for meal time or even when strolling out. Do you have a particular product in mind? What made you decide to buy it? Share it with me.